Dr. Wayne Whitney received his doctor of veterinary medicine from Louisiana State University in 1982. After one year of general practice in Houston, he completed a one-year internship and a three-year surgical residency at The Animal Medical Center in New York. He became board certified by the American College of Veterinary Surgeons in 1989. Dr. Whitney was with Gulf Coast Veterinary Specialists when its doors opened that same year. 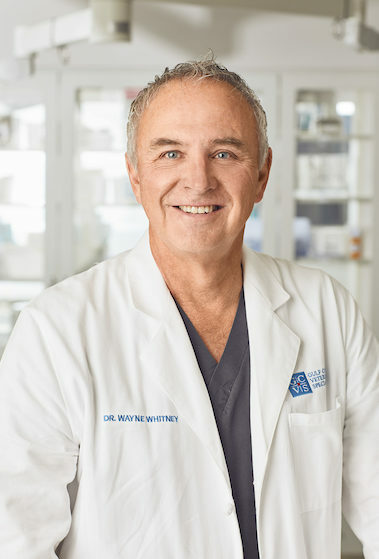 Dr. Whitney’s career has been primarily devoted to the development and advancement of canine arthroscopy, with continued special emphasis on improving techniques for the cranial cruciate injuries. Dr. Whitney is a co-author of the industry-defining textbook, Small Animal Arthroscopy. Dr. Whitney has a heavy caseload of canine sports medicine, including field trial and agility dogs. In 2018, Dr. Whitney was named a Founding Fellow in Minimally Invasive Surgery – Small Animal Orthopedics (arthroscopy and fracture repair) by the American College of Veterinary Surgeons. So grateful to have such an accomplished veterinarian like Dr. Whitney care for my dog, and his caring manner supersedes his impressive resume. Allison has been fantastic, answering every question and concern. So so thankful. My dog will have improved quality of life.